Because of being house bound for a few days we really had to scurry in order to get everything ready. We came up with a few craft ideas and had to gather all the stuff to make them with, bought some pretty paper partyware and decided on the cake design. We were ready! Three girls cancelled out at the last minute which really made the size of the gathering nicer. (What’s a zillion giggling girls minus three?) They started out making Fruit Loop necklaces (no that wasn’t myidea) and just chatting about nothing in particular. When the last girl arrived it was time for them to get busy making their dinner. I had made a triple batch of pizza dough crust (This was the first time I did it without a bread machine so I was crossing my fingers that it would work out!) The girls got to pull out their crust in any shape they wanted and put whatever toppings appealed to them on their own personal pizzas. I was so relieved that they turned out so well. 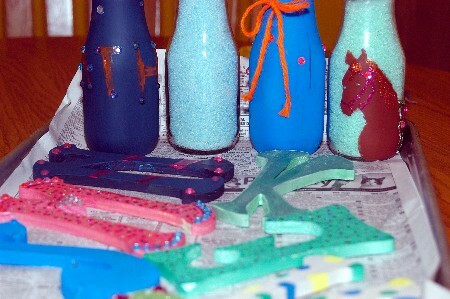 We went on to decorating wooden initials and making bath salts. I was pretty sure they would rush through this in no time, but they worked on these for a couple of hours. I think they turned out pretty nice. After all that exhausting work, it was time for cake and ice cream. 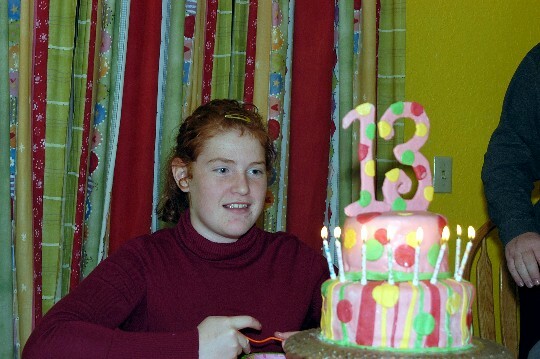 Mimi had put the candles all the way around the cake before she realized how hard it would be to blow them out in one breath in order to get her wish. So one of her friends spun the cake around really fast and to our amazement, Mimi got them all blown out! After cake, we all sat around the table telling stories about the worse, grossest thing that ever happened to us. (Can you guess who started this topic?) I kept expecting the girls to get tired of having the parents around, but they really seemed to enjoy chatting with us. Well, except for Mimi. She was a bit embarrassed, but that’s typical of her and we are pretty good at ignoring it. 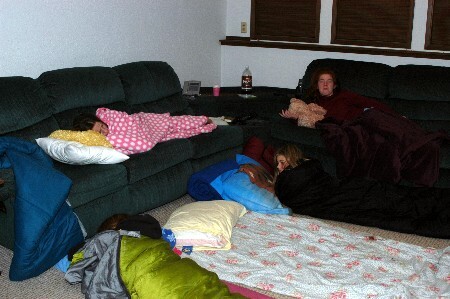 They finally went downstairs where they were supposed to watch a movie and then go to sleep. I put Shaun in charge of making sure they didn’t go crazy. He did a good job of that….but it never occurred to him to make them go to sleep. Apparently the last one didn’t fall asleep until about six. Ugh! I had a hard time waking them all up at 11:00 so they wouldn’t be complete zombies when their parents came to get them. All in all, it was a fun party. They all had a great time. Happy Birthday to our little girl! This entry was posted in Mimi. Bookmark the permalink. 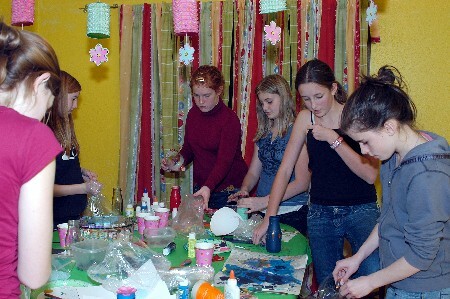 Happy Birthday to Mimi, her party looks like great fun. I think that the most memorable party for my children or at least for me was their fifth year birthday parties. For both sons, who are three years apart, after their fourth birthday, not a day went by that each child did not foretell what and how his fifth birthday was going to be. With all the input. it was easy to plan a great party. Joyeaux Anniversaire Mimi! I LOVE the cake! She’s really turning out to be a great beauty. I like when people make funy things with hands, it’s a small art. My mither is doing similars to that. Happy Birthday Mimi! Beautiful girls having a great time. It doesn’t get much better than that. I miss those days…Great cake by the way. I’m still in awe of the cake! That’s so cool. What a great birthday party. I’m 23 and I think I’D get a kick out of attending. Happy Birthday to you! Happy Birthday to you! Happy Birthday dear Mimi, Happy Birthday to you!